The bathroom is probably one of the smallest rooms in your home, but it is also one of the most frequently used spaces, so it needs to look its best! According to HGTV.com, there are various ways of giving your washroom a quick update with items that you can turn into fashionable bathroom accessories. If you have some old jugs or glass containers, use them to your advantage. These vessels can be a wonderful option to store jewelry, and it will give the bathroom a visual boost. You should also look into your living room or bedroom for decorative accents that could find a new home in your bathroom. Organization is key to traffic flow and reducing clutter, and this can be the most inexpensive update of all. Clean house and get rid of your old toiletries and make them easily accessible in your medicine cabinet. 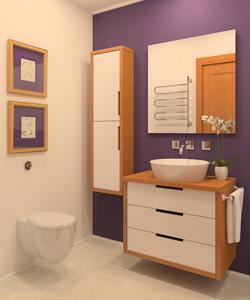 With an increase in counter space, the bathroom will feel much more cozy and versatile. Cost-effective updates are one of the most popular segments of contemporary interior design and can truly change the nature of a room. What sorts of cheap updates do you have in mind for your bathroom?